Place all of the marinade ingredients into a bowl apart from the fresh red chilli and fresh coriander. Mix it up well and coat each wing in the sauce. Cover and place the wings in the fridge. Cover the rest of your sauce and also put that in the fridge for later. Preheat the oven to 180°C / 160°C fan / 350°F / gas 4. Take your wings out of the fridge and scrape excess mixture off them back into the bowl. Pat the wings dry with kitchen roll and place them on a baking tray. Put your wings in the oven and cook them for 20-25 minutes. While your wings are cooking heat through the sauce on a simmer until reduced by about half. 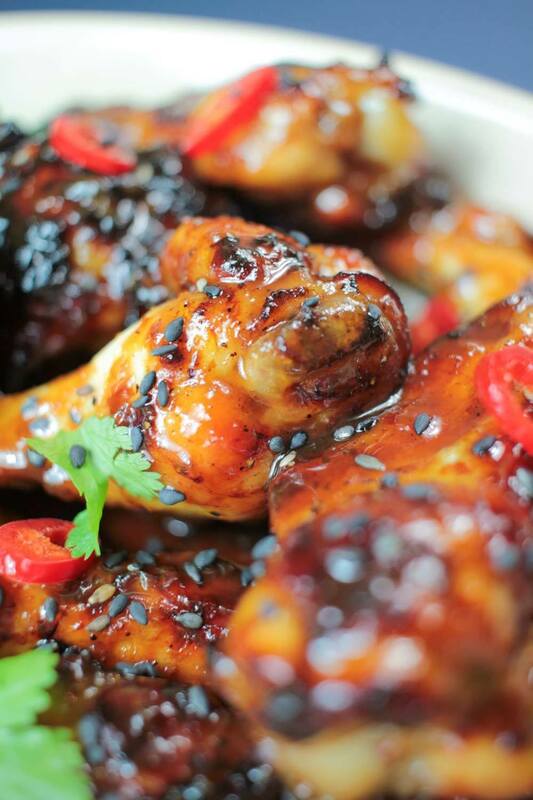 Take your wings out of the oven and pour over the sauce and sprinkle with sesame seeds, red chili and coriander. Serve and enjoy getting messy!! !